Is It Time for a New Internet Router? Broadband @ Home » Connected @ Home » Is It Time for a New Internet Router? The first thing you should do is test your bandwidth speed with multiple configurations. Run the test with only one device connected to the router. You may find that one device in particular is drawing a lot of the bandwidth by itself. Also, run the test with the device wired, as well as wireless. Wireless always produces less bandwidth as the signal passes through the air to get to the device. If the router is producing low bandwidth under a wired configuration, then it is possible that the router is getting a little run down. There are several things that can cause a drop in bandwidth. If one of the kids in the other room was playing on the computer and left 10 browser windows open when she left to go outside, the open windows are still using bandwidth even though no one is at the computer. Depending how high-tech your home is, you may have gaming consoles, phones, tablets, computers, DVD players, or even refrigerators connected to your router. Any or all of these items could be sucking the bandwidth from the other devices. Technically, there may not be anything wrong with your router except it is old and tired. The router is a tool, and as technology advances, the tool must be upgraded to keep up. Look at your router — if it’s a 802.11b or g, then it is time to upgrade. Your router should be 802.11n compliant. 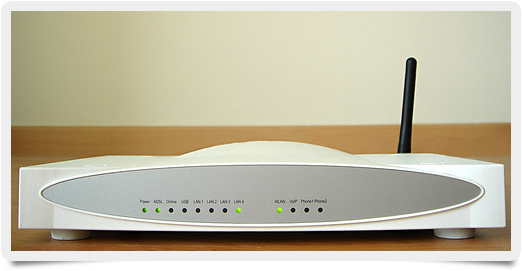 If you have several newer devices in your home, you may want to consider a dual-band wireless router. As PCMag points out, not everyone needs a dual-band router, but you may soon. The dual-band sends out two signals, one at 2.4 GHz (same as your garage door opener) and another at 5 GHz. Newer devices are equipped to handle the higher frequency 5 GHz. The nice thing about dual-bands is that they connect appropriate devices to the 5 GHz signal and allow you to connect your older devices to the 2.4 GHz signal at the same time. Whether your router needs to be replaced now or not, you can bet the time is not too far away. Until you feel the time is right to invest in a new Internet router, make sure to update the software on your current model. Use that old router as long as you can, because technology is changing and so must the tools to get that bandwidth to your home.